Pecking Order is pleased to announce the addition of Boonworms™ into our family of products for backyard poultry. 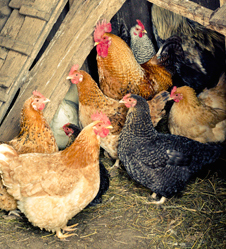 Mealworms, are high in protein but only Boonworms™ are naturally calcium rich to support egg development in laying hens. Pecking Order offers Boonworms™ straight or blended with mealworms to provide poultry with something new and something familiar. Either option will provide poultry with a high protein treat that supports healthy feather growth and makes interaction with flocks an enjoyable and rewarding experience. Gourmet Mealworm Treat offers a variety of carefully selected wholesome ingredients that add more enjoyment and diversity into your flock’s feeding regimen. When you combine ingredients like mealworms, sunflower hearts, raisins, corn, peanuts, and flax seed, you have to call it gourmet… just like your chickens would! This entry was posted on Sunday, December 9th, 2018 at 10:30 pm	and is filed under Chicken, Chicken Chat, Chicks. You can follow any responses to this entry through the RSS 2.0 feed. Both comments and pings are currently closed.